This is a youtube video I made today, check it out! Everyone needs friends. Some people are fortunate to have lots of friends living close by to them, others are not so fortunate. I have a couple of friends but I hardly ever see them or spend time with them. I feel lonely. My friends have their own lives to lead I can’t expect them to make a lot of time for me. But it is still hard. Maybe you have experienced this, if you have I am sorry for you. It is tough feeling lonely. But there is a positive. I have one friend who is always with me and never leaves me, he is always close by to me. Sometimes I try to run from him but he never leaves. He is a great listener, always available 24/7. Sometime I forget all of this so it is a good reminder for myself. Jesus can be your friend too. I’m blessed with a supportive family and a God who cares for me… but it is still hard, and I do feel lonely, I know I am not alone but I still feel that way sometimes. I need to go out and make some more friends, but I stay home a lot more than I probably should. companions. I am thankful for them, without them, my family and God I would be a lot worse off. God is good all the time, all the time God is good. Sometimes it is just hard to see the good in everything. I have to learn to trust God more and turn to him. He is my strength otherwise I would have no hope. My favorite verse: “The Lord is my helper; I will not be afraid. What is out beyond your sight? What is growing in the night? But I say, have no fear! For always, Jesus is near! Maybe you’re dreaming about that new car or getting your nails done, getting that new t-shirt, or getting that kitten. Maybe all your attention is going into getting that raise at work. Maybe you’re like me, and you’re spending a lot of your time stressing out about things that don’t really matter. Things like losing that few pounds, or going to that appointment next week. The world tries to sell you so much stuff that you don’t need, and things that are actually not important. The things that really matter, are the things that last into eternity after death. Everyone lives forever; it is where you will live that is the question. God want us all to spend eternity with him, but he leaves that decision up to us. How much time do I spend worrying about earthly things when none of it will last into eternity? I bet no one is going to be fat in heaven, so why stress so much about it? I’m recovering from anorexia, so this new thought is like totally mind blowing for me. Why do I worry so much about weight when it doesn’t really matter? Yes, our bodies are temples of the Holy Spirit if we are God’s children, and God wants us to take care of our bodies. However, I’m sure he doesn’t want us to go to the extreme, and unhealthily obsess about our looks and weight. It is not the outward appearance that really matters; more importantly, it is who we are in the inside. What do we spend out time doing and thinking about? Is it honoring to God? We should be asking ourselves if we will bring whatever it is, with us into eternity. I’m not saying we shouldn’t enjoy ourselves if it is honoring to God, I’m just saying for me anyway, I want to turn my focus toward the things that really matter, and things that will last. It is my heart’s desire to follow God, but the world and its desires, and advertisements, sometimes sidetrack me, and I get caught up in the latest thing that I think I need. 1 John 2:17 says, ” The world and its desires pass away, but whoever does the will of God lives forever.” And Matthew 6:33 says, “But seek first his kingdom and his righteousness, and all these things will be given to you as well.” I want to try to seek God’s kingdom and store up my treasures in heaven, rather than on earth? Is anyone with me? Dogs are a wonderful creation of God. They are more than simply a pet- or at least my dog is to me. My dog is my friend, buddy, companion, and. Helper. My dog follows me around the house everywhere I go and sits or lays beside or on me. I think she would do almost anything for me, and me for her. 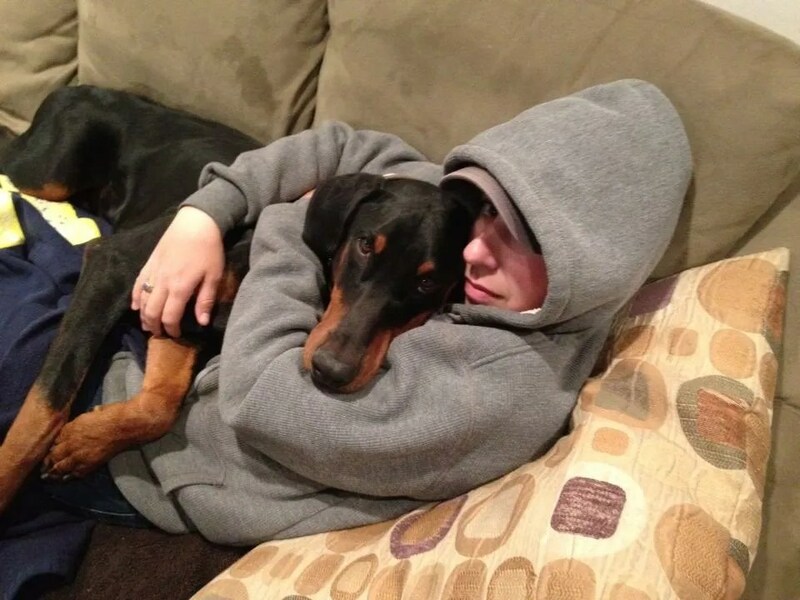 But sometimes when I am really distressed my dog doesn’t quite know what to do, she will just look at me almost saying, “I know your upset, I want to help, but how?” In this post I will teach you step by step how to teach your dog to give you deep pressure therapy, or simply ‘a hug’. Deep pressure therapy is very helpful in calming anxiety and helping you to focus in on the moment, if your anything like me you may need a lot of help doing those things sometimes. These steps are based off of your dog already knowing basic commands. Have a special treat ready. Lie down on a bed, couch, or floor, then get the attention of your dog. Step Two- Call your dog beside you. 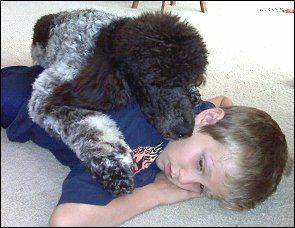 Bring your hand with the treat to above your face hovering over your chest, slowly lead your dog to walk on top of you. Give treat. Repeat the same step, except this time, give the command to lye down when the dog is on top of you. Give treat. Work on this until the dog will readily lye down on top of you with its paws on your chest. If it is a big dog they may only put their paws and chest on you, if it is a small dog they can lay right on top of you. Switch the command from lay down to ‘Hug’ Or whatever cue you want to give. Practice until the dog will give you ‘a hug’ at any moment. This is a more advanced step. Once your dog readily will give you ‘a hug’ by your cue, you can train it to give you a ‘hug’ by your distressed symptoms. For example if you hyperventilate when your really anxious, then for this exercise fake the noise and say “hug”. After a bunch of practice your dog will learn to give you a hug when you hyperventilate. That is the 6 steps to teach your dog how to hug you. Enjoy your dog hugs!